Clockwise from top left: Hamad International Airport catering facility in Qatar, Al Jaber Hospital in Kuwait, Gulf Galvanising Factory in Abu Dhabi and Jebel Omar in Makkah, Saudi Arabia ... key projects. Jeremias Group, which offers a wide range of engineered high-temperature stainless steel flue, exhaust and chimney systems that can be used for various applications, has recently established a regional office in the UAE to get closer to the GCC market. The European group, which set up its office in Dubai in April last year, has newly clinched a contract to supply chimneys for the boilers at the Terminal Five at King Khalid International Airport (KKIA) in Riyadh, Saudi Arabia, according to Faisal Harb, regional manager at Jeremias Middle East. It has also undertaken a string of projects in the region including the Jebel Omar project in Makkah, Saudi Arabia. Its list of successes in Qatar include the Marriott and Regent hotels, the new Hamad International Airport and Al Wajba Palace; while in the UAE it has supplied for the Sofitel on The Palm Jumeirah, the Ritz-Carton (both in Dubai) and the Emirates Pearl hotel and Etihad Towers hotel (both in Abu Dhabi). According to Harb, the company has a foothold in the hotels and hospitals sector of the regional market. 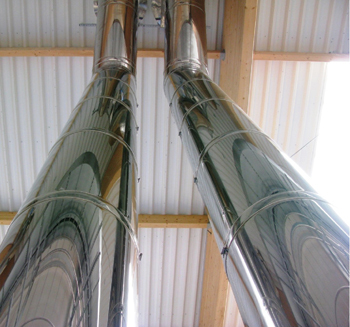 Harb points out that while there are many local companies that offer chimneys and flues, there are very few that offer stainless steel systems of such high grade. Ritz Carlton Hotel in Dubai ... Jeremias systems installed. “We are now looking at changing the mind-set in the market by promoting our high quality prefabricated exhaust systems that offer a range of unique selling points (USPs),” says Harb. These USPs include ease of installation (conical connection) with no welding required on site; corrosion resistance; no hot spots, as the system comprises two pipes with rockwool preinsulation; lightweight; fire rated; and international certification including UL (Underwriters Laboratories) and CE. The products also come with a full range of fittings, a 25-year product guarantee, German engineering and international and local support. “Jeremias offers the unique metal-to-metal connection to hold extreme exhaust pressures and temperatures. Its system design services including all necessary accessories as valves, silencers, and expansion bellows,” he adds. Jeremias flue and chimney systems focus on two main sectors: sanitary hot water supply and power generation. “Especially in major projects like hospitals, the Jeremias chimney systems provides the security of a certified system that are fire rated and offer quick installation,” says Harb. The company’s flue systems are suitable for all needs in the food industry, among other applications. “Jeremias has wide expertise in providing exhaust and ventilation systems for the food industry including kitchen exhausts, steam exhausts, and steam recovery systems from bakery ovens. Convenience food producers around the world rely on the solutions provided by Jeremias, which are hygienic, easy to clean, corrosion resistant, fire rated, lightweight and offer a long life,” says Harb. 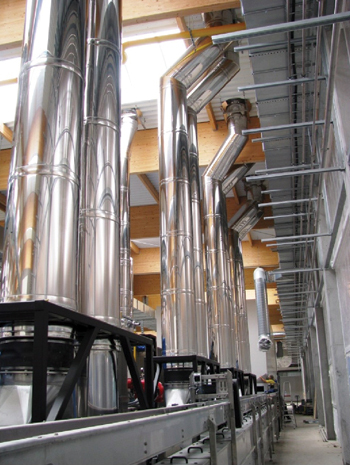 The company produces pre-fabricated exhausts systems from stainless steel. Its product range covers generator/turbine exhausts, cogeneration/CHP (combined heat and power)-incinerator exhausts, and exhausts for industrial processes, engines, dry ovens, and kitchens. “Jeremias provides the expertise for the exhaust of the products of combustion from power generators (primary and standby) and boilers (hot water and steam boilers) leading exhaust gases to the exterior of the buildings in a fast, safe and silent way,” he says. The Jeremias Group is one of Europe’s leading manufacturers of flue and chimney systems made of stainless steel, steel, plastics and ceramics. 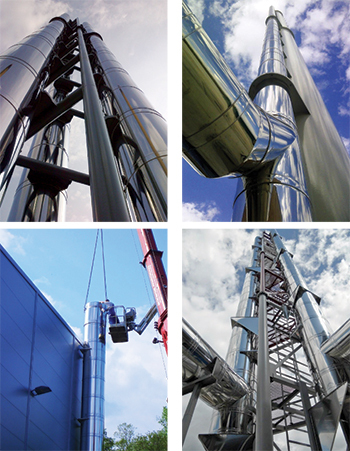 It develops and manufactures chimney solutions for industrial applications and individual domestic constructions. Jeremias’ products are manufactured in seven plants in six different countries.